Written on January 12 and posted today as a Favorite . . . This is a portion of the Ark story we might find interesting. In earlier chapters, the Philistines have taken the Ark, hoping to benefit from what they believe to be its extraordinary power. What they do not understand is that the Ark is not an object of magic or superstition to be used as they wish. What it does hold is this: Aaron’s staff which bloomed as a sign of God’s presence when the Hebrews were captive in Egypt, manna that sustained them in the desert as they journeyed toward the land promised to them by God, and the tablets of commandments given them by God through Moses. It is not the Ark which now sustains the Israelites in battle as they struggle to maintain their identity in a world that wishes to eliminate them, it is God himself. And this is something the Philistines do not understand. Things have gone badly for them since they seized the Ark in a raid and now they wonder how to best dispose of it. We enter the story today and watch as they determine what to do. There are wonderful lessons to be learned from all of this. First, God does not exist in some inanimate object. God is within and without because God is everywhere. We cannot hide from God, nor can we sort of summon God and put him away when we do and do not want him present. Because God is everywhere, we need never fear that we are alone; and we must work to form our best relationship with God. Second, we cannot somehow seize, steal or borrow someone else’s successful relationship with God. We cannot pretend with God, nor can we fake anything with God. Because God is authentic, it is impossible to form a false bond with him; and our best connection will be one that is open, honest, and humble. Third, we cannot manipulate God in any way. We cannot bargain, control or wheedle our way into God’s goodness, nor can we avoid God in any way. Because God is omnipotent, it is impossible to out-maneuver God; and the best way to interact with him is with frankness and readiness to do God’s will. There is, no doubt, much we might say about this reading; but the simple message is this: Our honesty, authenticity, security and humility are key to a healthy relationship with God. In today’s MAGNIFICAT Morning Prayer mini-reflection we read: Now and then, God’s people of old needed to be reminded of the care with which his love had surrounded and protected them. Now and then we do too! This introduces a canticle from Deuteronomy 32:3-7, 10-12. You may want to read it today. It concludes . . . The Lord alone was their leader, no strange god was with him. The Philistines do not understand the true source of Israel’s power. Believing it to come from a magic box, they do not comprehend that true power and authority comes from an honest, authentic and humble relationship with God. We hold this in our hands and feet each day. Our power comes from the way we act out our relationship with God. Let us pray for the grace to accept this gift, for the meekness to allow God to work within us, and the serenity that comes from knowing that we are secure in God who has no strange gods with him. A re-post from November 4, 2011. Cameron, Peter John, ed. “Prayer for the Morning.” MAGNIFICAT. 12.1 (2011): Print. No matter how many times I read this story I continue to be curious about Rebekah, the woman who changes the course of history when she urges Jacob to deceive his aging father in order to steal his brother’s birthright. In her elegant yet simple scheme she takes on all culpability and allows both Jacob and Isaac to stand by passively as the story unfolds. This dichotomy of action versus inaction is reflected in the values these family members choose; and it calls us to examine our way of relating to others in this world. 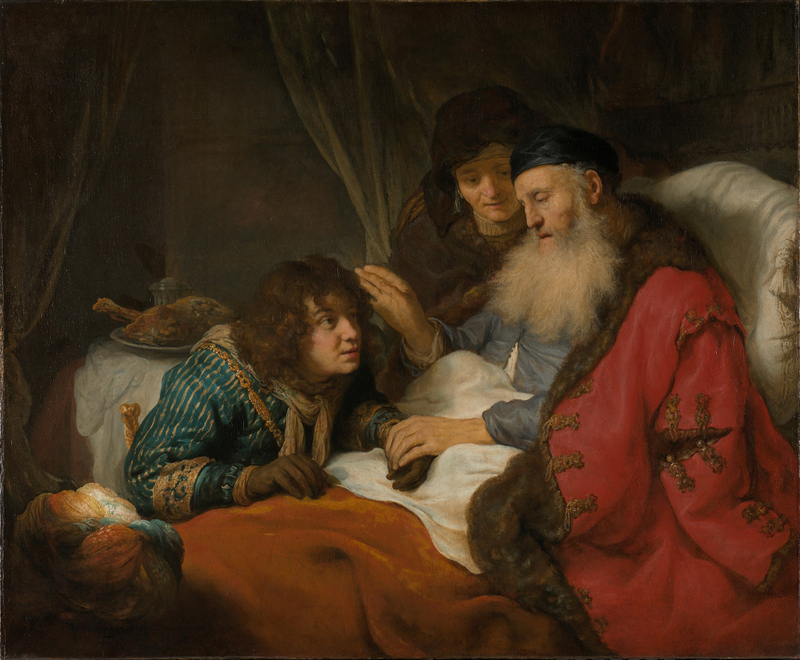 From the HARPERCOLLINS BIBLE COMMENTARY (99): “Jacob’s disguise involves his wearing his brother Esau’s clothing; as will be seen, deception involving clothing is an important motif in the narrative about Jacob’s beloved son Joseph (37:31-33)”. A son deceives his father . . . this son is in turn deceived by his own sons. We can only wonder if years later Jacob sees this echo of himself in any way when he realizes what has happened to his beloved son, Joseph. In all of this deception, the result is the same: separation from those we love and pain we had not intended. The joy and hope we looked for cannot flourish in a life of shadows and secrets. The irony is not lost on us that by participating in fraud, we may gain our immediate objective . . . but we will also experience a lifetime of rippling, unforeseen consequences that we may not want or like. We humans struggle to climb to the top of the heap, to arrive first, to be the most liked, the best fed, shod and clothed. Many of us use any means to justify this end while others of us reject deception of any kind to hug closely the values of integrity and honesty. This uncomplicated choice of deceit versus honesty is presented to us in Psalm 101: Norm of Life for Rulers. We may want to pray it today as we consider who we choose as our companions in life . . . and who we are as companions to others. I follow the way of integrity . . . I do not allow into my presence anyone who speaks perversely . . . I shun the devious of heart; the wicked I do not tolerate . . . Those who follow the way of integrity, they alone can enter my service. No one who practices deceit can hold a post in my court . . . I look to the faithful of the land; they alone can be my companions. Mays, James L., ed. HARPERCOLLINS BIBLE COMMENTARY. New York, New York: HarperCollins Publishers, 1988. 99. Print. We will be away from the Internet for several days. Please enjoy this reflection first posted on July 19, 2011. “The sin of Ananais and Sapphira did not consist in the withholding of part of the money but in their deception of the community. Their deaths are ascribed to a lie to the Holy Spirit (3.9), i.e., they accepted an honor accorded them by the community for their generosity, but in reality they were not deserving of it”. (Senior 191) Thinking through this story gives us the opportunity to reflect on the concept of honor: what it is, how it is rightly and wrongly earned, why we bestow it on others, and what we do with an award accorded to us. We might immediately think of warriors who risk life itself as they defend people, property or concepts. Medals are given – sometimes posthumously – to those who give of themselves at great personal cost. Some of these heroes deny that they have done anything above or beyond what another would have done. We spectators know differently and so we honor those who think of themselves last at such great physical, psychological, and personal expense. As in today’s example, we might honor philanthropists, those among us who are gifted with an abundance of talent or goods either directly earned or inherited. Many humanitarians give anonymously in order to better share what they have. Some have strict guidelines a petitioner must follow in order to win an award. Still others give loudly and with fanfare. In any or all of these cases, we give accolades and recognition to those who share their wealth. There are also those among us who give at great personal and spiritual price. These holy warriors have no money and little talent for physical defense; yet they are as important as any other kind of hero and they too must be honored. We all know holy people who either boldly or quietly prayed themselves and many others into God’s hands. Their value is greater than rubies or pearls for the battle they wage is with the greatest and darkest of powers. Saints whose names form the litanies we pray are obvious spiritual heroes; but there are many of these holy ones among us . . . and we rely on them more than we know. We must recognize them as easily as we do the heroes of war and wealth. In today’s story we find lots to think about: How Ananais and Sapphira think they can deceive God himself, how the community first admires this couple and then is stunned at the immediate consequences of their deceitful actions. Perhaps God is setting an early example of what it means to live in Christ-like community: honesty, integrity, trust and fidelity are hallmarks of a truly unified yet diverse group. Lies only fool those who create them for the truth is always revealed . . . sometimes immediately . . . always with certainty. We all know people who accept credit where it is not due. We may have seen these people of the lie come unraveled . . . or we may believe that these people live long, blameless lives without just compensation for the pain they cause. We need not worry about these deceivers as today’s story tells us. We need only fix ourselves on maintaining our own purity of purpose as we move through each day. We will take solace from the often-sung Psalm 73 as we pray . . . Truly God is good to those who are pure of heart. But as for me, my feet had nearly slipped; I had almost tripped and fallen; because I envied the proud and saw the prosperity of the wicked: for they suffer no pain, and their bodies are sleek and sound; in the misfortunes of others they have to share; they are not afflicted as other are; therefore they wear pride like a necklace and wrap their violence about them like a cloak . . . When I tried to understand these things, it was too hard for me; until I entered the sanctuary of God and discerned the end of the wicked . . . Oh how suddenly them come to destruction . . . Like a dream when one awakes; O Lord, when you arise you make their image vanish. Senior, Donald, ed. THE CATHOLIC STUDY BIBLE. New York, Oxford University Press, 1990.191. Print. We will be away from the Internet for several days. Please enjoy this reflection first posted on July 8, 2011. Commentary will tell us that this psalm was likely written to accompany a procession with the Ark around the Temple precinct, or even through the city or countryside. When we look at these verses closely, we see that they contain a list of qualities that describe God’s people: the clean of hand, the pure of heart, those who are not devoted to idols and who do not lie. God’s power and goodness are affirmed; God is seen as the designer and initiator of creation. With this song the people celebrate the glory of God and the goodness that resides in his creation . . . the earth. They also confirm the values God’s faithful will want to espouse: purity and integrity. Scripture begins with the creation story we have heard so often that we may move through it too quickly. When Genesis 1 is read with care, and when it is compared to other creation stories, we will want to join in the singing of this hymn to God who is so much different and so much more wonderful than any other god. The God of Genesis 1 is our compassionate God who calls order out of chaos, goodness out of evil, light out of the dark. This universal God wants to celebrate with us and about us. This universal God wants to heal us, transform us, save and redeem us. This God calls us to purity and honesty, integrity and truth. This God created the earth and all her goodness for us. This God does not enslave us but suffers and dies for us. This God is one we call Father, Brother and Spirit of Love . . . for this God loves us beyond all measure. Let us join in this hymn of praise to God . . . The earth is the Lord’s and all it holds, the world and those who live there . . .
ARCHAEOLOGICAL STUDY BIBLE (NIV). Grand Rapids, Michigan: Zondervan, 2005. 5. Print. We will be away from the Internet for several days. Please enjoy this reflection first posted on July 7, 2011. We seek wisdom, justice, prudence and restoration of all that has been lost. Old Testament wisdom writers remind the rulers of this world that the solution to chaos lies in the wisdom that lasts forever. And we see wisdom more clearly when we conduct our lives with honesty. Love justice, you rulers of the world. Set your minds sincerely on the Lord, and look for God with all honesty. The writers further warn that it is quite easy to slip away from the way God calls us to walk. Dishonest thoughts separate people from God, and if we are foolish enough to test God, God’s power will put us to shame. How do we employ this ancient wisdom? What do we do today when we find ourselves engulfed in turmoil? How do we filter the false from the real? Wisdom is a spirit that is friendly to people, but she will not forgive anyone who speaks against God, for God knows our feelings and thoughts, and hears our every word. How much do we avoid believing that we can hide our dishonesty from our Creator? What do we do to follow the way of honesty and the wisdom God’s way? Since the Lord’s spirit fills the entire world, and holds everything in it together, Wisdom knows every word that people say. These ancient words repeat to us the importance of stripping all deceit from our lives, and the significance of cleaving always to God’s call for integrity and sincerity. When we use the scripture link and the drop-down menus to compare other translations of these verses, we fog of confusion rises to reveal God’s way of integrity. How does Nehemiah confront oppression in the process of rebuilding Jerusalem? When we examine this chapter of his story, we find that Nehemiah operates with transparency, honesty, and generosity. When Nehemiah receives God’s call, he answers it in a very big way; he does not do things in half measures. We see that he regards his work in re-building as his vocation and he does not take monetary re-payment for the work of the rebuilding. Nor does he take credit for this amazing feat. In contrast to his predecessors, he takes no reimbursement for his work in the rebuilding Jerusalem’s city walls and Temple. He makes both the physical and financial outlay knowing that God will sustain him. In this way, Nehemiah shows us how to understand our true relationship with our creator. Nehemiah is an excellent administrator who prays constantly, and who is constantly guided by God. He is neither self-serving nor glory seeking. He understands that God does all, and is all. He speaks with God as his good friend and says: Keep in mind, O my God, in my favor all that I did for this people. Together with the priest, Ezra, Nehemiah creates a physical structure that enables the faithful to return to Yahweh. He invites the Jewish people, magistrates and peoples from all nations to his table – something unusual for an observing Jew of his era – yet he listens for God’s voice and does whatever is asked of him to realize the work laid out by his God. He rises over a foreign king, distant and local enemies, long-entrenched customs, gossip, and even the in-fighting raging around him in order to achieve this incredible goal of taking the rubble that surrounds him in order to participate in the making of God’s kingdom for both God and God’s people. We, today, can be new Nehemiahs. We can create around us structures that are collegial, safe, and predictable. We can form relationships that are open, honest, and supportive. We can refrain from nay-saying, gossip and destructive thinking. We can seek solutions, listen more than we talk, think of self last, and remember that God does all and is all. Adapted from a reflection written on December 23, 2007.